Memory strategies have helped SGT Robert Fisher. He was exposed to an improvised explosive blast in Iraq and now has problems with his short-term memory. He often forgets his doctor’s appointments. He also forgets to take his medication for Posttraumatic Stress Disorder (PTSD) and right leg pain from a shrapnel wound and surgery. SGT Fisher is about to retire early from the military. He now uses a"Smart Phone' with alarms that help him remember appointments and to take his medication. 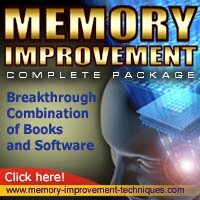 NOTE: Don't forget memory strategies to combat memory loss with good brain health and nutrition. Other cuing memory strategy aids assist those with memory loss to organize work assignments, calendars, and other information in a logical arrangement. This helps the person to facilitate the completion of tasks and events. A device known as a "Pocket Coach" is a memory strategy aid and prompter designed for use by people with cognitive disabilities, brain injury, or who have had strokes. This software is for a personal digital assistant (PDA) or Smart Phone that enables the user, family memory or caregiver to record a series of messages, prompts, or task instructions for the user. The user can then use the device to either play back the messages in sequence or as a verbal to do list. Betty Wilson is only 62 but was diagnosed last year with early onset of Alzheimer's disease last year. Her husband Ben is concerned about her getting lost even when following behind him recently on s short trip to their daughter's house. "When she left our driveway she made a left turn instead of a right and went about 10 miles before I got her back on track." Betty now has a ”Medic Alert Safe Return" identification just in case she loses her way. Reports say that 6 out of 10 Alzheimer's patient's use this memory strategy ID. There is a data base that contains the contact information and can be used to locate a person more effectively. Global Positioning Satellite (GPS) systems either stand alone or as part of a Smart Phone' are also useful tools for those with memory loss. People can use this memory loss technology by having a GPS locator put in their cell phone or in a watch that is synched up with a map. Family or other caregiver's can then access the information from a computer to locate the person at any time. According to a recent story on the St. Petersburg station Channel 13, wearing an 'EmFinders' bracelet can save the life of a loved one who may have wondered off. Whether it’s a child with autism or a family member with dementia, the tacking device inside the watch can track people. Family just calls 911 and the device is activated. A few minutes later the police know exactly where the person is located and they can be quickly found. The device costs about $200 but has been a life saver. The device is being used at the Rocky River Senior Center in Ohio and in the St Petersburg Bay area as well as other areas around the country. "Word Prediction Software" can be used on a computer to help with word finding problems common for those with memory loss. The software predicts the person words based on the words recently typed and the how frequently the memory loss survivor types the same words. The software can also help to improve sentence structure and grammar. For those with memory loss who are attending school, the Pulse"Smartpen" from Livescribe is a computer within a pen. The device records and links what the person hears to what they write. In this way, the student never misses a word in class. You can listen to your lecture or recordings by tapping on your notes. All your notes and recordings are captured by your Pulse Smartpen. The student can also transfer their notes and recordings to their computer, search for words within their notes, and even share them with classmates and friends. Follow the link below to find out more information about this kind of technology.